Drawing on old manuscripts and biographies written by Saints, Fr. William Bullen Morris describes one of the great events in the life of St. Patrick. It was in 433 - the year following his arrival in the country - that the Apostle of Ireland was first brought face to face with King Laeghaire and the false Druid priests. At Tara, the political center of the Kingdom, St. Patrick defied the Druid law and lit the Easter fire on the Hill of Slane, today in County Meath, not far from Dublin. We may suppose that St. Patrick foresaw what the result of a victory of the Faith would be in such a place under those circumstances, and how he might strike at once at the superstition of the whole nation through its spiritual and temporal chiefs. 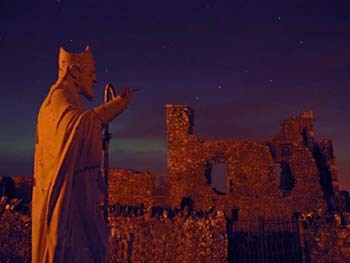 When Easter drew nigh, the Saint, who was then at Slane, resolved to make an attack upon the reigning idolatry by celebrating the Catholic Feast in the chief stronghold of superstition, Magh-Bregh in Meath, near the royal residence of Tara. It was in Holy Week that our Apostle, leaving Slane, set out for Tara, and, arriving at a plain in sight of the King Laeghaire’s palace, lit the Easter fire. Now, it was one of the laws of the festival that the pagans were then celebrating that, upon this night, the fires should be extinguished on every hearth in Erin, and death was the penalty if anyone kindled his own before the first fire lit by the Druid priests in Tara was seen shining in the darkness of the night. King Laeghaire saw the sacred fire, and asked who it was that had violated his law. Then the Druids told him that if this fire were not put out before morning, it would never be extinguished, and that the man who had lighted it would be exalted above kings and princes. Infuriated at these words, the King of Tara mounted his chariot as the day was breaking and set out to meet the Saint, at the same time declaring his determination to put him to death. 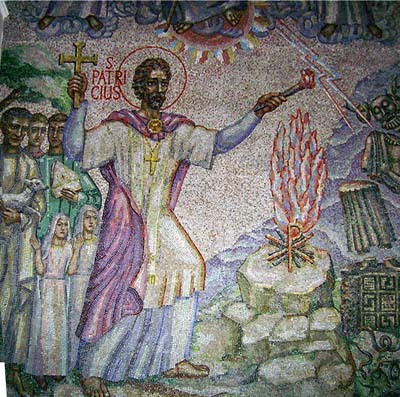 When Laeghaire came in sight of St. Patrick and his companions, he was warned by his false priests not to go near the fire but to send for the Saint, and orders were given that no one should rise up to meet him. The royal party had dismounted, and, in the words of St. Evin, “they were before him, and the rims of their shields against their chins. But none of them rose up before him, except one man alone, who came forth as a figure from God, i.e., Erc, son of Dega. … Patrick blessed him, and he believed in God.” This was the first victory of St. Patrick on the Hill of Slane. In the contest that followed, the Saint’s chief antagonist was Luchru, one of the heathen priests, who had so deluded the people by his magical arts that they paid him something like divine honors. Before everyone he boasted that he had power to ascend to heaven. Then, in the sight of all, he arose from the earth. Then the man of God, Patrick, prayed, and his prayer brought the imposter down and he lay lifeless on the earth. This was the second victory of St. Patrick at Tara. God heard His servant by sending a terrible tempest that swept the plain, and in the darkness and panic that ensued, the swords of the pagans were turned against each other. The Queen, who was present, was won to the faith. This victory thus ended the first day of Patrick’s struggle at the Hill of Slane at Tara. King Laeghaire, amazed but still unsubordinated, dissimulated, and asked the Saint to come to see him at his palace on the next day. Doubtless he thought, like Simon Magus when witnessing the Apostle’s powers, that St. Patrick was no more than a magician and that he could find some way to subdue him. He determined to make another attempt on the Saint’s life. With this purpose he posted men on all the roads that led from Slane to Tara. The Saint, to whom God had revealed the King’s intention, took eight of his clerics and a boy, Benignus, to bear him company. After blessing them, he set out on his way. The soldiers of the King, who were lying in wait to slay the company saw nothing, however, but eight deer followed by a fawn which passed by on the mountain path. It was on this journey from Slane to Tara that the Saint composed and sang the beautiful hymn of invocation, known as St. Patrick’s Lorica, or Breastplate, portions of which are still used by the Irish peasantry in their prayers. And thus did St. Patrick and his companions, with the help of Almighty God, avoid the trap of the King. On Easter Sunday St. Patrick arrived at Tara, and appeared before the astonished King.